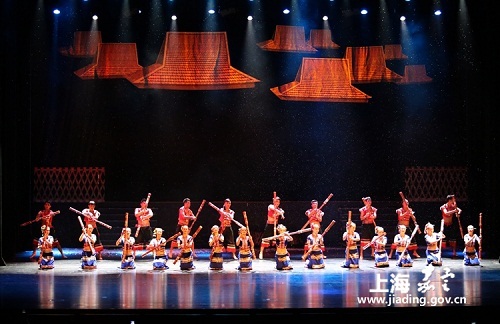 A large-scale folk production magnificently combining dance and opera descended on the Poly Grand Theater in Shanghai's Jiading district on Aug 9. The opera was conceived in the Yunnan city of Pu'er and is currently on a nationwide tour following an acclaimed debut performance in Beijing on Aug 6. The opera spans 80 minutes and consists of five sections, each providing a unique artistic reflection of Pu'er, a city with profound and vibrant cultural heritage. The opera showcases a spectacular variety of artistic talent, skilled dancers that grace the stage with intelligent movement, ornate and colorful costumes that seem to enliven the whole theatre, and a dynamic set design that houses the whole production thoughtfully. It is hoped that the touring of this opera around the country will increase the national exposure for both Pu'er and Chinese folk art. One thing is for certain, audiences will be curious to find out more about the charms of this delightful city in Yunnan. Pu'er is located in southern Yunnan province and is well known for its diverse traditional culture. The region boasts residents of 14 different ethnic groups, including Hani, Yi, Lahu, and Dai.